AFP: "Israel plans more than 1,000 new settlement homes"
Settlement watchdog Peace Now said the administration of Israeli Prime Minister Benjamin Netanyahu was pursuing the well-worn path of creating facts on the ground in a bid to block any two-state solution to the Israeli-Palestinian conflict. The Jerusalem Post: "Tenders issued for 1,028 units beyond Green Line"
According to information published by the Construction and Housing Ministry on Sunday, 500 of the units will be located in Har Homa, a Jewish neighborhood in east Jerusalem. 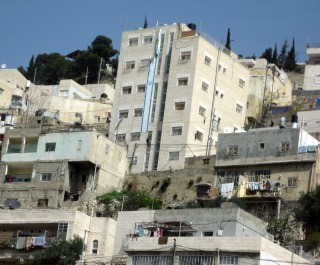 Left-wing activists see Har Homa as one of the most controversial Jewish neighborhoods in the capital, because it was started after the Oslo Accords were signed and because it creates a barrier of Jewish homes between east Jerusalem Arab neighborhoods and Bethlehem. As everybody who cares about foreign policy (and hasn't been living under a rock) knows by now, earlier this week the PLO was admitted as a full member by UNESCO, triggering pre-existing U.S. laws that mandate an immediate and 100% cut-off in U.S. funding to UNESCO. These laws likewise mandate such a cut-off of funding to the UN, any specialized agency of the UN, or any affiliated organization of the UN who follows suit. With the Palestinians reportedly planning to apply for membership in at least 16 more agencies, the specter of a far-reaching U.S. withdrawal from international agencies - including from agencies like the IAEA and WIPO, looms large. And with it looms the specter of far-reaching consequences for U.S. international influence, leverage, and engagement, and for the U.S ability to protect and promote its interests across the whole spectrum of issues around the globe. Absent from the reporting and debate around this issue is any real notice of the fact that the rationale that existed for passage of these laws in 1990 and 1994 no longer exists. Objectively speaking, what we are seeing today is U.S. policy at the UN being hijacked by a pair of legislative anachronisms. The extremist settlers call it "Price Tag." We have always called it by its proper name: Terrorism. Now, Israel's Shin Bet, the IDF's top brass and Israeli Cabinet members agree with us. On Monday, shortly after a mosque was torched in an Israeli-Arab village in the Galilee and "Price Tag" graffiti was found nearby, Internal Security Minister Yitzhak Aharonovitch, a member of the extreme right wing Yisrael Beitenu Party, told an Israel Radio reporter that he prefers not to use the perpetrators self-serving jargon. "This is an act of terrorism," he said. The problem is that largely because of law enforcement negligence, a terror campaign that has been raging in the West Bank for at least three years, has now mushroomed into a widespread phenomenon - both in the West Bank and in Israel proper - that targets not only West Bank Palestinians but also Israeli Arab citizens, Israeli peace activists and Israeli law enforcement officers. Hagit Ofran is Director of the Israeli Peace Now movement;s Settlement Watch Project. (7/19/11) There is a sense of outrage within the Israeli public following the passing of "the boycott law" in the Knesset last week. The law allows any individual or institution who faces possible damage as a result of any person's call for boycott settlement products to sue that person. Evidence of actual damage will not be required. Organizations calling for such boycott could lose their legal standing as non profit organization. Peace Now slams Jerusalem mayor's complicity in settlement outpost. Yariv Oppenheimer -- Peace Now's director -- today published the following op-ed in the popular Israeli daily newspaper Ma'ariv.